Terry Callier's beginnings as a folk interpreter get a stunning birthday present from Craft Recordings' 50th anniversary edition of The New Folk Sound of Terry Callier. Although he'd go on to even better things, especially when he began writing songs for Chess/Cadet artists, such as the Dells and Rotary Connection (featuring Minnie Riperton) and then recording his own albums for the label, Terry Callier was a convincing talent right from the start. His one-off for the Prestige company demonstrates this unequivocally. It's mostly American and Anglo traditional folk, with Callier's guitar and voice supported, unusually, by two bass players - Terbour Attenborough and John Tweedle. Had it gone on general release when intended (1965), Callier might have become a more prominent part of the folk revival with people like Joan Baez, Eric Andersen, and Judy Collins. As it was, the album didn't emerge until 1968 when the focus was starting to shift towards folk-rock and the singer/songwriter. In 1972, Callier would alter his approach accordingly with a series of albums for Chess/Cadet that remains some of his best works. 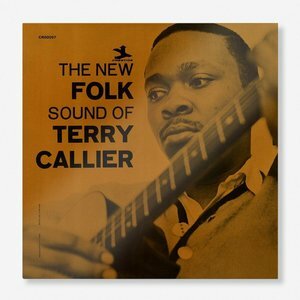 As for The New Folk Sound of Terry Callier, it's a terrific album. Since these songs tell protracted stories, Callier's disciplined enunciation is a vital asset. It may be billed as the 'folk' sound, but these arrangements frequently draw on jazz and blues, particularly "Spin, Spin, Spin" with its astonishing time-signature cross-currents, mixing 4/4, 2/4 and 6/8. Fans of classic-era Pentangle should investigate if they haven't already. The original album weighed in at a concise eight tracks. The bonus content brings that up to 15, including some tracks that have appeared on previous expanded editions ("Jack O'Diamonds", "Golden Apples of the Sun"), and some hitherto unreleased alternate takes of tracks from the main album. The original album opens with "900 Miles", a homesick traveler's lament and, like everything on the set, there's a precision, a beautiful exactness to Callier's interpretation. Many, including Odetta, have sung the song, but Callier renders it with a charcoal-and-silk voice that demonstrates just how soulful traditional folk music can be in the right hands. "Oh Dear, What Can The Matter Be", popularised in America after it traveled over from England in the 1700s, is slightly weakened in this setting by the use of the third person ("He promised he'd buy her a sack of blue ribbons / To tie up her bonny brown hair"). One of the great strengths of folk music is its tradition of allowing singers to become men or women regardless of their real-life identities (something appreciated by James Taylor when he took on the role of an abandoned mother and factory worker in his song "Millworker") and it's a shame that Callier balked at playing the love-lorn maiden. Side Two features several non-traditional songs, including "It's About Time" and "Spin, Spin, Spin", but they're all written in something approximating the trad-folk style, so there's no jarring stylistic lurch. They sit perfectly well with the well-worn "Promenade in Green". The original album concludes with the anguished lament, "I'm a Drifter", from the celebrated pen of the late Travis Edmonson. It's a gripping tale of rootlessness set to a workmanlike folk melody and a fitting end to this melancholy debut. Callier wouldn't make a second album until 1972's Occasional Rain. By then, he was on a different plateau entirely, working with the inestimable pianist/arranger Charles Stepney and becoming an auteur rather than just an interpreter, with a larger band and lavish orchestrations. This inspired streak continued with What Color Is Love (1972) and I Just Can't Help Myself (1974). Even when his music was given a commercial sheen at Elektra in the late 1970s (see "Disco in the Sky" from 1978's Fire and Ice), he still included formidable songs outlining his social convictions ("Martin St. Martin"). After leaving the industry, working in programming and studying sociology, he came back for another run of well-liked albums in the late 1990s thanks, in part, to a younger-generation following in the UK and Europe. What elevates this reissue well ahead of all previous attempts to bring The New Folk Sound back to the market is the way the Craft label have lavished such telling and genuine care on it. They did a similarly excellent treatment of, among other things, two Isaac Hayes titles last year, and, since parent company, Concord have been snapping up catalogs left, right and center, we can probably expect more of the same with other artists. When you see a name like Kevin Gray (responsible for cutting the lacquers for the double-vinyl format), you know that this is a conscientious reissue resulting in an archive-quality product. In fact, every aspect of the vinyl release is impossible to fault, from the thick cardboard of the gatefold to the protective poly-lined inner sleeves and the retaining of the Prestige logo. Craft Recordings have created a reissue which is on a par with those put out by Mobile Fidelity, the now-defunct Audio Fidelity, Analog Spark, and Intervention Records, but they've done it without elevating the prices (a boutique audiophile label would probably slap a $50 tag on this reissue). The company is simultaneously issuing the album on CD. While the original liner notes (by Rent Foreman, who also wrote a couple of the non-trad songs) are included, they strain for 1960s hipness in a way that now reads rather embarrassingly. While it's great to have them from a historical perspective, the new notes by Jason P. Woodbury convey the information with far greater clarity and elegance. This is where the Terry Callier story begins and, in its new incarnation, the album is in better shape than ever before. The new notes speak of a "haunting grace", and there could be no better or more accurate summation of the music than that.